Drew Bledsoe visits State House: Now what? Ansonia Wines: The Garagiste of the East? 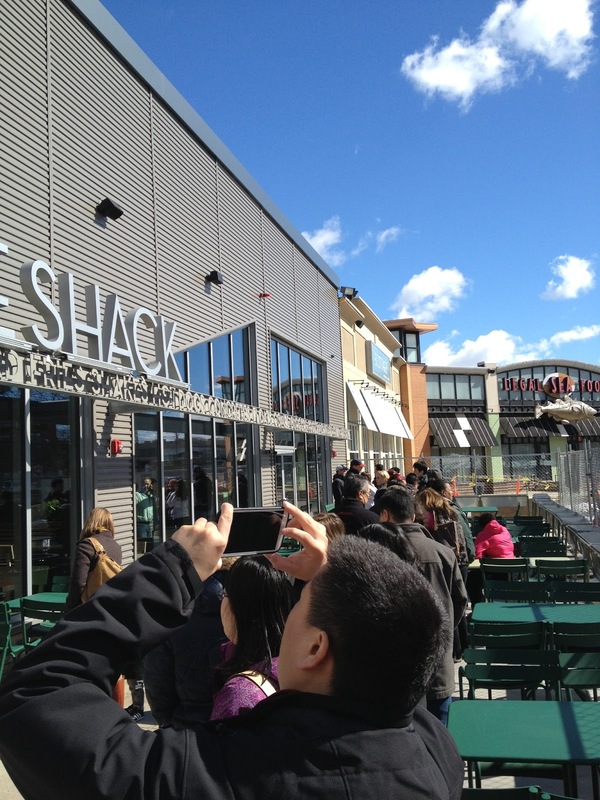 Shake Shack -- a trendy burger, fries, and shake eatery that originated as a New York City hot dog cart spin off from an upscale restaurant group -- opened in Chestnut Hill, MA this week. It's the 24th Shake Shack and this one is part of the new/revitalized The Street Chestnut Hill shopping center on Route 9 Westbound. We arrived at 10:50 am and although they don't open until 11:00 there was already a line twenty people deep, many of whom were eager to document their experience by taking pictures with their smartphones. The real pros (Yelp Elite types, not pictured here) wielded Nikon cameras with large lenses. There was a palpable "America loves the new" feeling in the air. So many spins on the hamburger have come to market and/or swept the nation lately. In-N-Out, Five Guys, Tasty Burger, Five Napkin Burger...what makes each of these places unique? I knew very little of the Shake Shack story coming in so I was interested to see how they'd play it. For how seemingly casual Shake Shack is on the surface (most simply described, it's a counter service restaurant that serves burgers) there were subtle upscale touches all over the place. And a noticeable focus on smart branding throughout. You're not just buying a burger and fries - you're buying an experience. An example of this is is their thoughtful wine list. When was the last time you saw a wine list like this at a counter service restaurant? 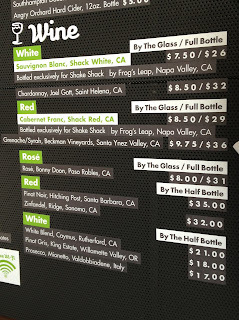 They've partnered with Frog's Leap on exclusive bottlings of Sauvignon Blanc (Shack White, $7.50 for a 6 oz glass, $26/bottle) and Cabernet Franc (Shack Red, $8.50 a glass, $29/bottle). How nice would it be to come here with another couple and share a reasonably priced bottle of wine with your meal? The long line moved quickly. They passed out menus while we were waiting so we'd made our selections by the time we got to the counter. Our order was taken efficiently with a smile and we were given a buzzer which would alert us when to return to the counter to pick up our food. Even though the place was already slammed our food was ready in about 10 minutes. To get a feel for what they do we ordered a bunch of things to share (much to the chagrin of our 5 year old who wasn't thrilled at all about sharing his Black and White Shake). The crinkle cut fries ($2.70) were solid but nothing spectacular. We got some regular and some cheese fries. I think I'd go for the cheese fries again but I can't say the fries are an area of strength. 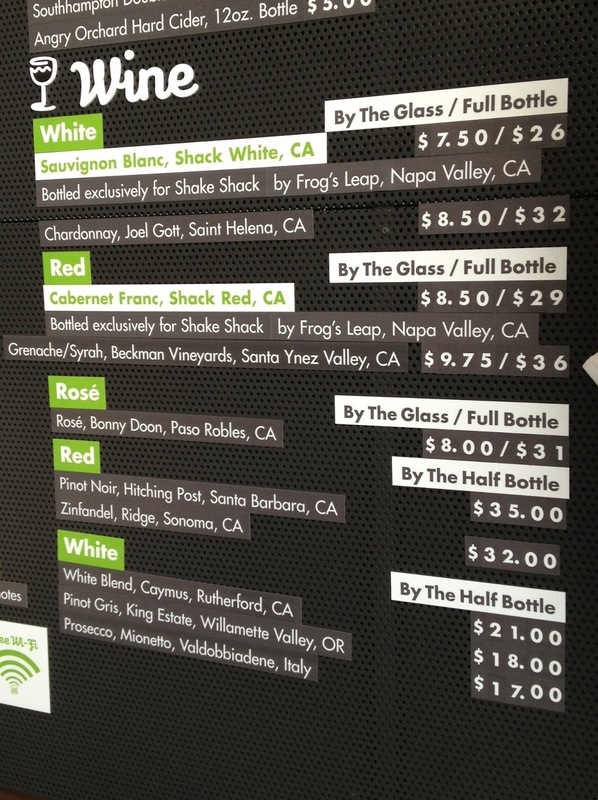 I paired it with a ShakeShack Red - the Frog's Leap Cabernet Franc. Just as I had taken a couple sips and was thinking to myself "hmm, this wine isn't that good" an employee stopped by to ask specifically how I liked the wine. You know how when sometimes a server asks how your food is and it doesn't seem like they really want to know? This was different. I got the sense he really wanted to know what I thought of the wine. I told him I didn't much care for it. I appreciated that it was served at a nice temperature (slightly cooler than the room) and that it was poured in a branded Shake Shack GoVino "glass" (I'm a fan of GoVino - check them out on Amazon here). But it just didn't offer much fruit and kind of smelled "flat". Not corked, just not quite lively or fresh. Turns out, he was the GM of the restaurant Dan Tavan. He asked if he could bring me a Beckman Vineyards Grenache/Syrah instead and I took him up on the offer. The Beckman was a nice upgrade - I'd recommended it if you stop in or see it around. Dan also brought over a couple of their white wines to taste. A crisp and delicious Sauvignon Blanc from Frog's Leap (the ShakeShack White) and an unoaked Chardonnay from Joel Gott. Both were very good (and paired nicely with the french fries!). If you or your kids like hot dogs, they offer a nice basic one for just $3 - "split and griddled crisp". I also tried a "Shack-cago" Dog. An outstanding rendition at just $4.00. Cucumbers, celery salt and more. 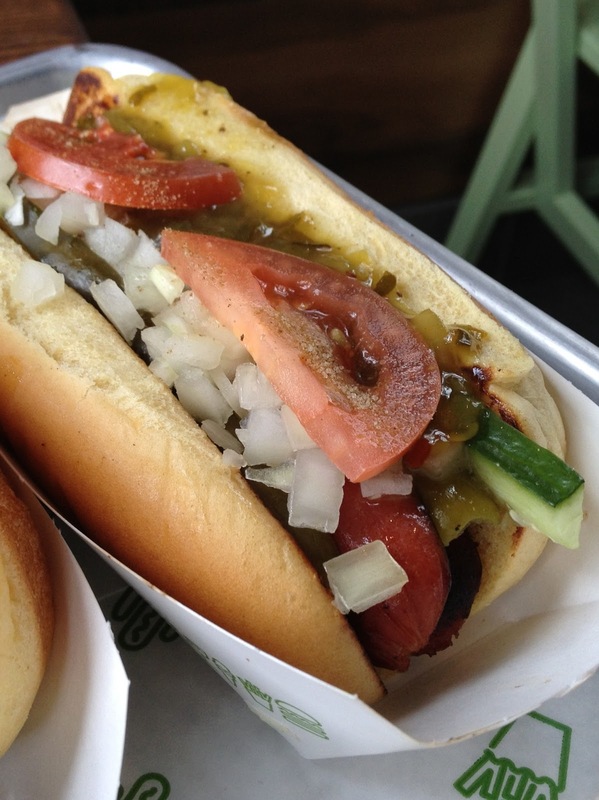 If you've never had a Chicago-style hot dog you've got to give it a try. And if you have I think you'd like this one. Since the word "Shake" is in the name of the place I thought it would be wise to try some of the treats. Fresh spun Frozen Custard is served in Shakes, Concretes, and Cups & Cones.We went for a Black & White Shake which was very good. Not too too thick, not too thin and very "ice creamy". I might go for a Chocolate Shake next time - for a little more rich chocolate flavor. The Revere's Tracks Concrete was spectacular. A Concrete is dense frozen custard blended at high speed with mix-ins. The Revere's Tracks offers unmistakable peanut butter sauce and chocolate sprinkles. But what seals the deal is the inclusion of some cheesecake blondie. Out of this world good. Highest recommendation. I hear the Lobstah Shell Concrete includes pastries from a famous North End bakery. We'll have to that a try next time. The bill came to $43.19 for four of us - and that included an $8.00 glass of wine. 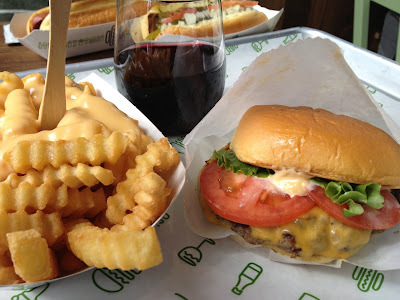 I was impressed with our first visit to Shake Shack. The branding is polished and thoughtful - everything has a snazzy logo on it. Some might see it as superfluous but I'm a sucker for good branding. If they think carefully about where the wood used to make their tables comes from (for example) it gives the impression they're thoughtful about everything they do. And I thought that thoughtfulness came across in the food and in the experience. The cheeseburger was solid and I thought the Chicago Dog was outstanding. The Revere's Tracks Concrete was amazing. I felt the prices were moderate and quite fair for the overall experience they're offering. Though it was crowded immediately upon opening I was comfortable when seated. No getting bumped into even though every seat was taken. Staff helped clear tables during the meal and stopped by to ask if we'd like anything else. The only question I'm left with is whether we'll make the effort to navigate the crowds here again any time soon. From what I've heard, if this location is like other Shake Shacks, it'll be a long time before the crowds die down. I'd recommend arriving early. 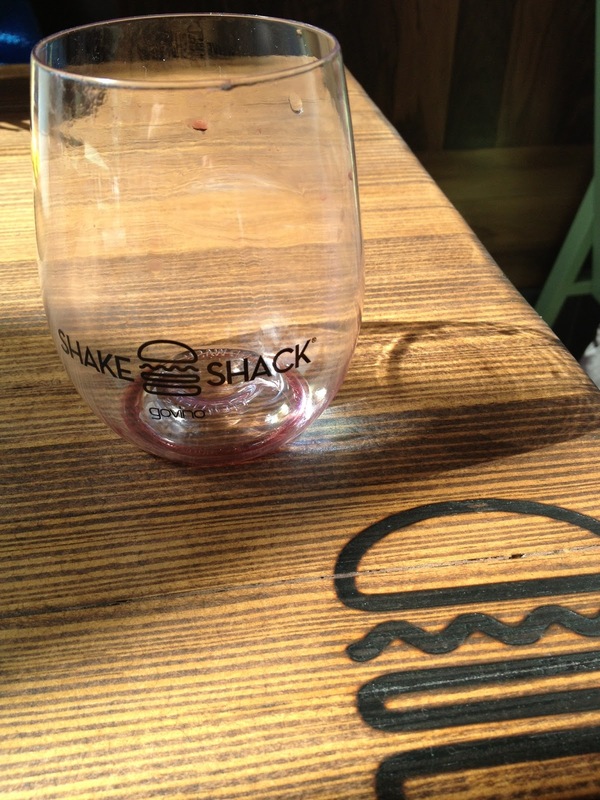 Question of the Day: Have you ever been to a Shake Shack? What do you think of them? What are some of your favorite things on the menu?